Hardcover, 8 1/2 in. x 11 in. The Complete Official MGB: 1975-1980 includes technical coverage of models sold in the United Kingdom and in North America during the model years 1975-1980. This MGB repair manual was prepared in close cooperation with British Leyland Motors in order to provide complete, authentic maintenance and repair information. 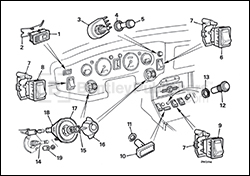 The Driver's Handbook, which comprises the first part of this manual, is the handbook which was provided with new MGBs. The Workshop Manual, which comprises the second-and largest-portion of this manual, is the official MGB factory repair manual. 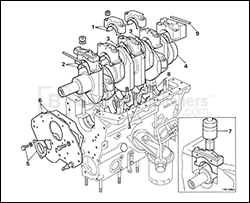 This manual contains emission control information that applies specifically to MGBs manufactured for the US market, and a complete illustrated catalog of special tools. 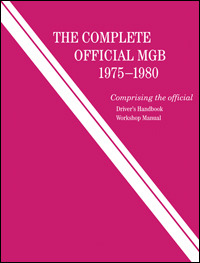 Including the accurate and comprehensive service information for 1975-1980 MGBs, The Complete Official MGB: 1975-1980 is an indispensable resource for both the professional mechanic and the MGB enthusiast. Bentley Publishers has incorporated additional factory procedures and specifications that became available following the publication of the original factory information. 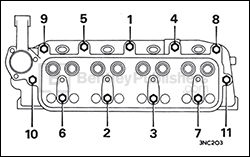 Cylinder head nut slackening and tightening sequence, page 103. Removing the crankshaft, page 112. The switches, lamps, and controls, page 230.